What is the course all about? KnowledgeHut now is offering CSD certification in Doha which will enhance the potential of an individual and make him assess his own technical competence in agile management techniques. The CSD training in Doha is imparted in two parts which is completed in five days. In the first part you are introduced to the Scrum principle and briefed about the framework. In the second part training is given in understanding the concept by organizing customized workshops, meticulously planned and taught by professionals in the field. Then you are recognized as the credential holder Benefits of the course Certified Scrum Developer training in Doha is thus tailor made for CSD credential holders. Those IT professionals desirous of undertaking this course will have to enroll for 3 days workshop or alternatively register for a 5 day CSD course in Doha. The sessions are conducted by professionals who are recognized as the best in their respective fields. The experience of learning through KnowledgeHut who are accredited as Registered Education Provider of Scrum alliance training is rewarding. 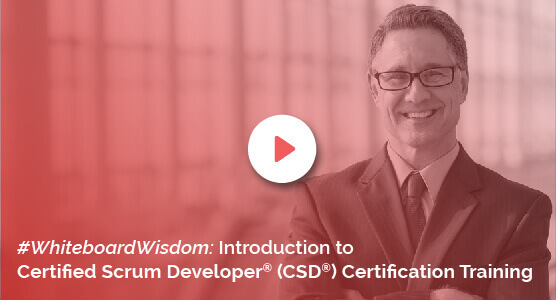 The certified scrum developer certification modules are created by trained instructors who impart training by giving demos and planning practice sessions to make learning proactive. The KnowledgeHut Way Study and course material are planned to suit the needs of those who undertake the coaching at KnowledgeHut to obtain the benefits. The Certified Scrum Developer certification and training will help in achieving your goals at a cost which is economical and enhances your career.